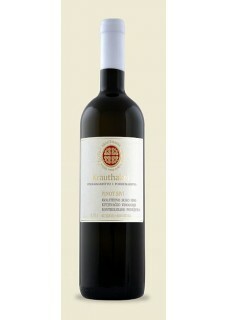 Vibrant, warm, perfected, harmonious, with well pronounced fruitiness and freshness, with no spiciness affected by wood. Of a brighter straw-yellow colour, crystal clarity; Nose hinting at ripe home grown white and green fruits, e.g. apples, pears, peaches, but also tropical fruits – traces of kiwi is detectable, as well as a nuance of lemon peel and hay. Salty on the palate, appropriate acidity harmoniously interacts with mild delectability. Nicely rounded taste, lasting considerably in the mouth. Vlado Krauthaker, BE Agronomy and oenologist, owner of Krauthaker Vineyards and Winery, contributes to rich winegrowing and winemaking tradition of Kutjevo region. At the time of its founding, the winery owned 1 hectare of vineyards, however by 2010, the winery became owner of 32 hectares of vineyards. The winery operates additional 68 hectares of third party owned vineyards. A particular attention is paid to indigenous Welschriesling variety – Graševina, which is frequently awarded gold medals at fairs and wine exhibitions. We would like to emphasize environmentally friendly winegrowing and constant quality as a major principle of our production. As particular climate and suitability of the Welschriesling varieties are fully employed, Krauthaker winery frequently produces predicate wines – spätlese and auslese wines as well as dried berries auslese wines. Apart from the exceptional Graševina (Welschriesling) we also nurture superior wines of other grape varieties: Sauvignon, Chardonnay, Pinot Gris, Zelenac, Merlot and Pinot Noir, which have all met good response at wine competitions. Quality and success of our wines is best described by numerous medals received at globally renowned wine competitions and tastings. We would like to single out the golden medals awarded to Graševina in Bordeaux, London and Burgundy as the favourite ones. At the Wine World Awards 2010 competition held by the Decanter magazine during London Wine Fair, we were awarded two silver medals, one bronze and four recommendations. The silver medals were awarded to Zelenac Kutjevo 2009, beerenauslese (BA) and Zelenac Kutjevo 2008, trockenbeerenauslese (TBA). The bronze medal was awarded to Graševina Mitrovac 2009, while Sauvignon 2009, Riesling 2009, Graševina Pomale 2009 and Graševina 2009, beerenauslese were awarded the recommendations.